One of my goals as a Christian who feels call to write for God is to write a blog that I wouldn’t feel embarrassed reading aloud to my mother, my children or Jesus Himself. Success in this area is hard. There are so many negative influences around and the world often feels like a hard and dark place. I have a lot of thoughts and ideas about these matters, and yet the last thing I want to do is stir up debate. So imagine my surprise when a fellow blogger awarded me with the “One Lovely Blog” award. My heartfelt thanks go to John Mark (who blogs at The Artistic Christian) for making my day with this award! He even gave it to me when I felt unsuccessful as a writer, inspiring me to put my hands to the keyboard and get back into the swing of blogging. John Mark is a fellow blogger for Christ. His blog, where he writes about a wide variety of life from book and movie reviews to pieces of flash fiction to antics from parenting his foster children, is entertaining, enlightening, and encouraging. I hope my readers will check out his blog as well. Now in order for me to accept the award, I must agree to the rules of acceptance. 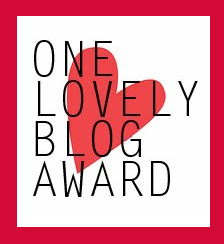 The rules of the “One Lovely Blog” Award are simple. A nominated blogger must (1) link back to the person who nominated them, (2) list these very rules and display their award, (3) share seven facts about themself, and (4) choose 5-15 blogs to nominate. Don’t expect to read any earth-shattering information here! I have led a very stable, quiet life for the most part. There are no wild tales from my past. Trust me. What you are about to read would likely bore even the most inquiring minds. And yet, this is not made up stuff. It’s all 100% true. You have my word. 1. I graduated valedictorian of my high school class. 2. I actually had to repeat Algebra I in high school, and later, in college, I accepted a bribe from a professor in order to pass my math elective class. Yes, random facts 1 and 2 are in direct opposition to each other. I always like to mention #1 first because it makes me feel better about myself. Besides, this fact only goes to prove what I was trying to say about #1 … I’m really not a genius. I may not even be all that smart, though I am exceptionally smart when compared to cookies in general. In regards to repeating my freshman algebra class, I must point out that I did not actually receive a failing grade. In fact, amy grades were high enough that I still managed to maintain a honor roll GPA. It was my mother, who upon helping me study for my final exam, discovered I had not the first clue about solving algebra problems. No amount of memorizing formulas was going to help me out. It was so bad that I didn’t understand what she was talking about when she asked me to show her how to “balance” an equation. She informed me right then and there that I would be retaking Algebra I, no matter how embarrassing I thought that would be. Surprisingly, the second time through algebra, I actually managed to learn quite a bit about solving equations … not that it helped me in college. Which brings me to the second half of this random fact … the part regarding a math professor and a bribe. Yes, it really is true. I took a bribe in order to pass a class. (Believe me. I am hanging my head in shame as I type.) The class was business algebra. I didn’t need it for my degree, but I did need a math elective. That semester I was involved in a teaching practicum, which involved me writing myriads of lesson plans, spending hours at the elementary school observing teachers and students, and finally actually teaching two weeks of lessons. Business algebra was not at the top of my list of priorities. When the final grades came in, I was 1/10th of a point from the grade I needed to pass my math elective. I did the only thing I could do. I went to the professor’s office, sat down across from his desk, and cried. I don’t know if he was just a nice man in general or if he decided to take pity on me. Either way, he said if I was willing to give him 1/10th of my first million, he would give me my passing grade. I told him I would never make a million as a teacher. So he said, “Give me a dime and we’ll call it good.” Luckily for me, I had a dime in my purse. I put it in his hand and walked out with a smile on my face. 3. I have moved more than 15 times in my adult life. 4. When I married Jon, he was nearly dead. 5. My passport is unused. 7. I am not a picky eater, but I cannot stand to eat canned peaches. There you have it. Seven really random facts about me, and I’m sure your life will be much richer for the knowing. Now it is time for the really fun part! Nominations! As a teacher and 4-H agent, I particularly loved giving out awards and prizes. It’s so much fun to recognize another person’s diligent efforts and hard work. I hope you’ll check out these lovely blogs, too! You ARE definitely one of the LOVELIEST bloggers and persons I’m blessed to know! And contrary to No. 1, you ARE also one of the smartest! 🙂 Can’t wait to catch up! This award was definitely well-deserved! Thanks for the great summary of my blog! It was fun to read a little about you… I had no idea that you were valedictorian of your class, or how much Jon has come through! The 4-H connection was fun, too. I was a 4-H Treasurer, back in the day! Another 4-H’er! Yay! 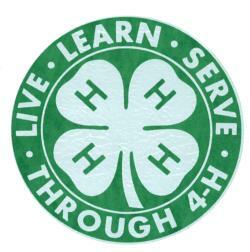 I am always amazed at how many people have a 4-H connection. Thank you, Diane! I always enjoy reading your comments here and your blog posts.